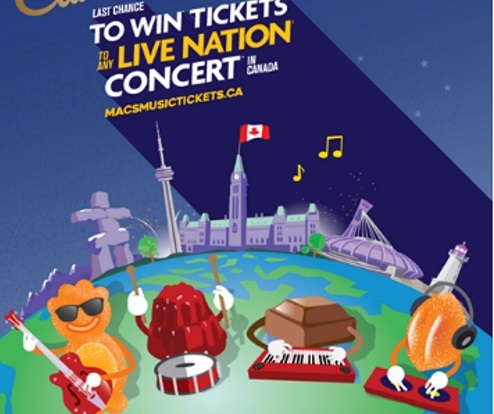 Mac’s and Cadbury are bringing you a chance to win tickets to any Live Nation concert in Canada. Open to residents of BC, AB, SK, MB, ON. 13+. Twenty Nine (29) prizes available in Ontario and Twenty nine (29) prizes available in BC, AB, SK & MB with each prize consisting of two (2) tickets to any participating Live Nation produced and promoted concert in Canada. One entry per person/calendar day. Contest closes October 10, 2015 at noon ET.